Jan. 15, 2005 Press release "Lovers & Fantasies"
Daisy DeBolt's music has come full circle (with a twist) with the release of her new independent CD "Lovers and Fantasies." The twist is that Daisy has returned to her folk roots with the perspective of a lifetime in music but without a trace of bitterness. She sings like someone who has lived but is not even slightly world-weary. Lyricists on the CD include novelist extraordinaire Michael Ondaatje of "The English Patient" fame. His "Midnight Highway" and "Joe Christmas" are classics of his own youthful writing. Both are polished gems of sardonic wit and are must-haves for his many admirers. 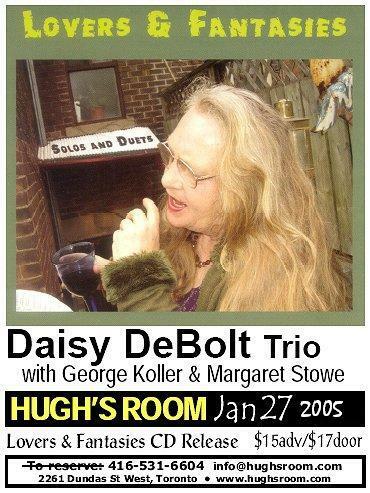 Instrumentation is mostly Daisy solo on acoustic guitar and mandolin with help from George Koller throughout on bass and a guest appearance of Margaret Stowe on electric guitar on "Over the Rainbow." Daisy shares production and arranging credits with Paul Benedict. Together they have created the showcase for Daisy's vocal talents and songwriting her fans have been asking for for years. In short, "Lovers and Fantasies" is a millennial CD for contemporary people who think and feel. It's also the singer-songwriter album you've been looking for since the 1970's but never could find. It speaks to you where you live and is well worth the wait. Like it says in the unique rendition of "Over The Rainbow" which concludes the CD, listen to Daisy and your troubles will melt like the proverbial lemon drops.